Randy Flores knows what it's like to pitch under pressure -- he saw his first Major League action back in 2002. But Tuesday night was a little different. When he took the mound for the final inning of Colorado Springs' game at Oklahoma City, he was trying to finish off something special. The Sky Sox's three pitchers before him had yet to surrender a hit. It was his job to finish off the no-hitter and his first thought was, "Don't screw it up." The 34-year-old left-hander delivered, striking out two in a perfect ninth inning that wrapped up a 5-0 victory and Colorado Springs' second no-hitter of the season. Brandon Hynick, the Colorado Rockies' Minor League Pitcher of the Year in 2007, threw a seven-inning perfect game on June 30. The last time a PCL team threw more than one no-hitter in a season was 2001, when Tacoma's Brett Tomko pitched one on July 3 against Oklahoma and John Halama tossed a perfect game against Calgary four days later. It also was the second no-hitter pitched at AT&T Bricktown Ballpark in five days after Oklahoma City's Luis Mendoza threw one on Friday against Salt Lake. "You're watching it go on and you're hoping and wishing and you're trying not to say anything to mess it up," said Flores, who has appeared in 16 games for the Rockies this season. "You're admiring the job that's going on and, when they pick your name, you're just hoping to piggyback on those guys' efforts." Top prospect Jhoulys Chacin got the start in his Triple-A debut, walking three and striking out three over 5 1/3 hitless innings before reaching his pitch count. "I just wanted to throw strikes," he said. "I attacked the zone early, first-pitch strikes, stuff like that. It feels amazing because you do what you're supposed to do, throw strikes. "A no-hitter, that doesn't happen too many times in your life." In his last appearance -- and first Major League start -- Chacin struggled with his control, issuing six walks over 2 2/3 innings. The Rockies sent him to Colorado Springs so he could work on his pitch location. The 21-year-old right-hander said he felt good about the outing, despite the three walks, saying he was able to recover after making mistakes. "He's got great stuff, a great approach," Flores added. "He's highly regarded in this organization and you can see why. It was really fun watching him throw." When Chacin exited, Joel Peralta finished off the sixth inning. 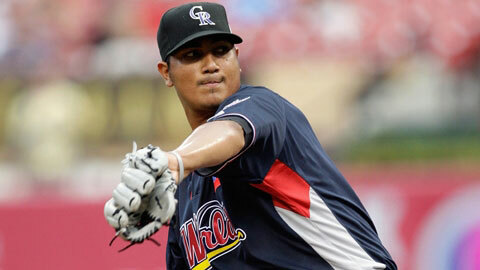 Interestingly enough, both Chacin and Peralta are from Maracaibo, Venezuela. Major League veteran Juan Rincon, making a rehab appearance after suffering stiffness in his pitching elbow, struck out three over two innings, leaving the final frame for Flores. "You're just trying to make pitches," Flores said. "You're trying to make smart pitches and execute. You can't control what the ball does once it leaves your hand, meaning you can't control where they hit it or what happens, so you just try to execute pitches." Flores compared the scene to a playoff game. As a player, he wanted to savor the moment, but he also needed to maintain his focus just in case he got the call. When he did, he was ready. "Everyone talks about how the playoff atmosphere is so great and special, but when you're playing in it, you're trying to treat it like any other game and do the things that make the game simple," he said. Mason Kelley is a contributor to MLB.com. This story was not subject to the approval of the National Association of Professional Baseball Leagues or its clubs.